The oil and gas industry has been in Venango County since the beginning. The first commercial oil well (Drake Well) was drilled at the northern edge of the county in 1859 along Oil Creek. We have therefore lived through and dealt with oil and gas issues for over 150 years. Being familiar with the issues does not mean you have dealt with them successfully. In many cases it only means that the problem has become part of the background of your life, common and ignored by many. Drinking water issues are probably the most common case. Residents not on municipal water systems just accept that their well water will need some form of filtration. The cause of the water problems has much to do with the thousands of well drilled in the area. Unfortunately the problem has been around for so long that local residents accept that it has "always" been that way. That is not to say we have lost the fight. In fact many of the improvements (solutions) are the result of disasters that occurred here. We no longer frac wells with nitroglycerin. Better casing materials and cemented annulus are now standard. Well plugging has changed from hammering a wooden plug into a well to cement at critical layers. Most of the improvements have been to make the drilling and extraction process more efficient for the oil companies. But at least a few have made life better for the residents of the area. Venango County is not only located on top of shallow oil and gas which is accessed via traditional drilling methods (Conventional Wells). But also on top of deeper formations including the Marcellus and Utica Shale formations which must be reached via unconventional processes (Unconventional Wells). 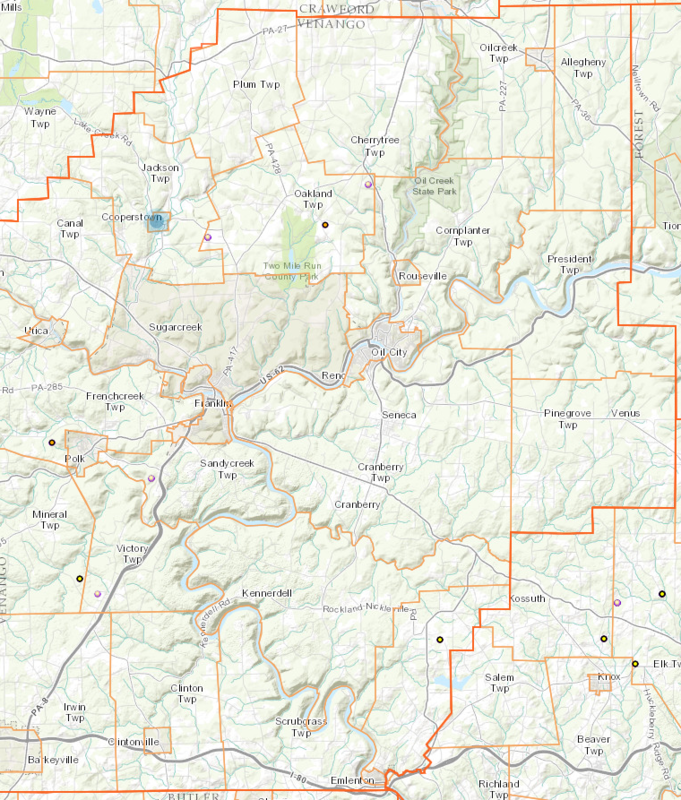 Recent drilling seems to indicate that the Marcellus shale is not as thick here as it is in other parts of the state. With gas prices low as of this writing (Feb. 2018) there do not seem to be large scale plans to drill the Marcellus. The Utica shale may be a different story. Utica shale although deeper seems to contain more wet gas products which are currently more valuable. Therefore drilling companies may be looking to drill more wells into the Utica shale. There are currently 5 shale gas wells in the county. Only one is considered "active". The others are shut in waiting for the price to increase. Click on the map to see their locations. Visit FracTracker.org for the latest information. Many problems remain and still need to be solved. Hopefully we can expose some of the issues to people in our area and elsewhere and find solutions. Work continues on backup links for each issue. Who owns the mineral rights under my land? If so, what are my liabilities? Can there be different leases on the same land? Can I use the land around a well site? Do the drillers need to revegatate the drill pad? Can the drillers keep me from accessing my land? Who is responsible for the abandoned wells when the lease runs out? What is my responsibility for abandoned well contamination getting into a stream? Anthony "Tony" Ingraffea presentation "Shale Gas and Oil Development" discusses gas industry myths, leaking wells, new research and the effects methane has on Climate Change. 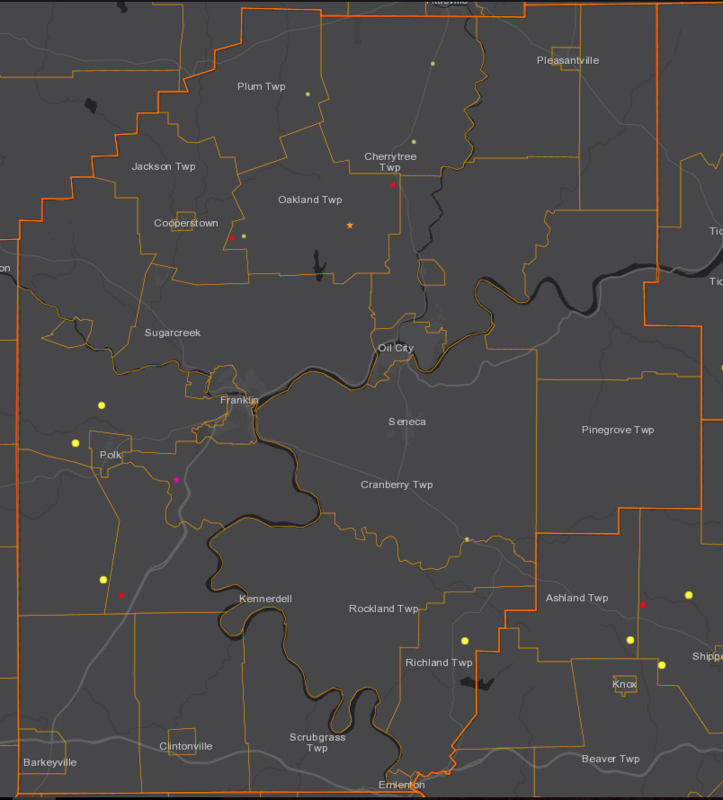 Map of shale gas wells in Venango County. Use fractracker.org to get the most current information. This is an example of both the construction and production casing of a Medina gas well. The sister well about 1/4 mile away already has a patch on the production casing. 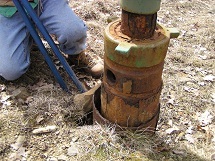 As the casing rusts through gas begins to leak from the well.